Does your fabric talk to you ??? Does your fabric talk to you??? I swear I hear my fabric shout at me to use it to make a specific quilt pattern. I found this delicious Kaufman floral print fabric and it kept yelling at me kaleidoscope, four patch kaleidoscope…. Then once I sewed the blocks together the fabric started yelling at me… HIP TO BE SQUARE ( pattern by Amy Davison of Goodrich MI) setting style. So here are my pictures of my quilt in progress. I will be writing more about it as I go along… I have several blogs planned talking about : my recent mini-Quilt retreat, the Gathering Ladies and events that occurred in July. The fabric is lusious, each block is about 4-1/2 inches but that varied block to block. There is a little less than 1/2 inch between the blocks so the seam allowances end up way scant. I really wish fabric designer would take into account how fabrics are actually used…. 3/4 of an inch would have been better for my project. What would you do with this fabric?? I took four of the same blocks and pieced them together. None of the blocks came out exactly, even so I floated each block in the sashing. I then had to figure the sashing making them extra long and squaring up the fabric after each step. I sewed the top sashing on squared it then sewed the side sashing on. The blocks were over size so I then carefully squared up the blocks to 12-1/2 inches. Four patches when sewn together varied in finished size. I had to recut my sashing strips about 1/2 inch bigger. I then squared the ends of the top and bottom sashing to be even with the block. Only then did I sew on my side sashing. I then squared up the block to 12- 1/2 inch square making sure my upper right corner was always consitent. I am hoping that I will have the illusion of correctly made blocks, as that is where the secondary pattern will develope. I laid out the blocks with the first set of sashing sewn together with the second set of sashing just to see what it looks like. This is my first completed block… I need 8 more for sure. Each section is 27 inches x 27 inches. I am not sure if I have enough fabric to make the queen size quilt I am hoping for. I do need to watch placement of my colors. I got the two heavy / dark colored blocks to close together. 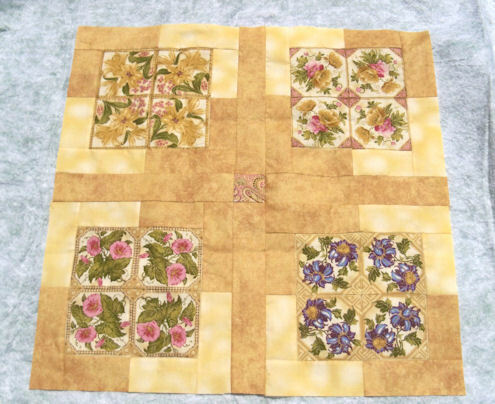 I think in the future I will make all the blocks with the first sashing on and then put them on the design wall before I go to the second sashing set so I can balance out the blocks more. The thing is before I can work on this quilt for myself I have the funraiser quilt I need to work on and finish. It is due in two weeks. I think that is what I am going to work on tonight. Grandson is gone with the other grandparents for vacation… so I will need to get busy in the evenings while the stitching time is there. 1/ As I started this quilt 6-8 mo ago I forgot some of the details of construction. I had used jelly rolls cut on an ACCUCUT from my LQS ( they were experimenting) I do not think they were totally accurate. I also cut some of my own fabrics using a rotary cutter and am not sure if those were accurate either. Next time I am going to try a commerical cut 2-1/2 STRIP PACKAGE or I will cut all of the strips myself. Hopefully that will make it more consistant. 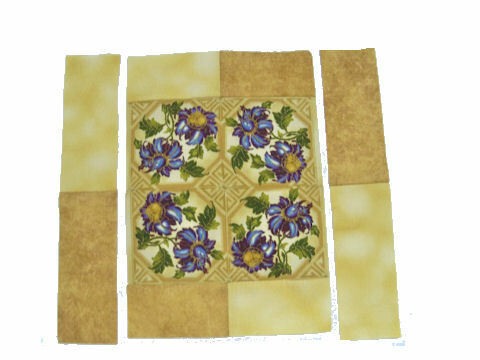 I found some neat BRIGHT BATIKS by TimeLess Treasures that will look great. 2/ I sewed the strips to make sets …. 80 inches long per directions. The longer the strip set… the less accurate they are. I should have sewn width of fabric ( or less ) to make the strip sets. I do well with short runs to make strip sets, but am not good on keep the long strip sets accurate. I was careful to not get any bowing in my strip set as I sewed each set of the strip sets alternating top and bottom. 3/ I had friends helps me sew the strip sets. ( long story) Upon examination of the strip sets I found some of the girls sewed with a true 1/4 inch and some sewed with a scant 1/4 inch. All discrepancies in the sewing compounded and the strips sets are miss aligned. I just have to know the source of PROBLEMS /MISTAKES etc so I can take steps to avoid or correct them in the future. YES THEY LEED TO DESIGN OPPURTUNITIES. 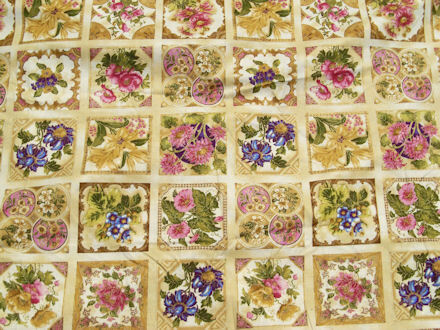 This is a QUILT AS YOU GO / SEW THEN FLIP method of quilting. If I had to do this again I would extend the stitiching lines all the way to the end of the fabric. I am probably going to go back and do that on columns I have not done yet. I will be adding borders to this quilt using the sew and flip method to. I am not yet sure what pattern I will use to make this quilt. WHAT A STORM …. JULY 15, 2010 …Half of Lapeer blew away! Knocked out the internet for several hours… just when I had some ideas for this blog. Now that the storm has passed I forgot what great ideas I had to post. The electricity went out at intervals which meant no TV/ quilt show DVDs. No light, to hand- stitch by or to read books or magazines. No electricity for the sewing machines… bummer. The storm blew the baby’s pool across the side yard ( over 100 yards) into the woods… Thankfully the pool survived, I would not be able to replace it. I would hate to image the rest of the summer with no baby pool. Wal-Mart and Miejers already sold off the summer pool stuff and have the fall and winter stuff out for sale…Who needs snow shovels in July? I still can not find Nee Nee’s favorite big ball. I think it might be in the woods or in the neighbor yard. I bet the dogs next door attack it and chew it up. Go figure, I never buy anything the stores put our this far ahead of time. I have found that, 1) When I need it; it will be on sale. 2) I do not have enough storage space as is I am not going to buy stuff I will not be able to use for 4-5 months. I think the stores are nuts to push seasons so far ahead. People who buy fall / winter stuff now are even nuttier. Maybe they want to space out their spending but the really good sales are always later. I am finding that the more time spent on blogging the less quilting I get done. I hope you will forgive me for not posting more than once a week. I do plan to post pictures as I go along more often… Family pictures and quilts in progress will be posted as I go along. I am back into my UFO stack of boxes. I pulled out what I call my cancer quilt. I started it for a girl I know that had surgery for breast cancer. She was negative and since she did not need the quilt for chemo treatments I ended up going back to work on a different projects planning to work on this quilt later. It no longer seemed to be an emergency. I always had this quilt in the back of my mind to finish but family quilts took precedent. Recently, another girl I work with was just diagnosed with breast cancer, so I dug out this quilt. I plan to finish it either for her fundraiser in August or to give directly to her to use during her chemo treatments. 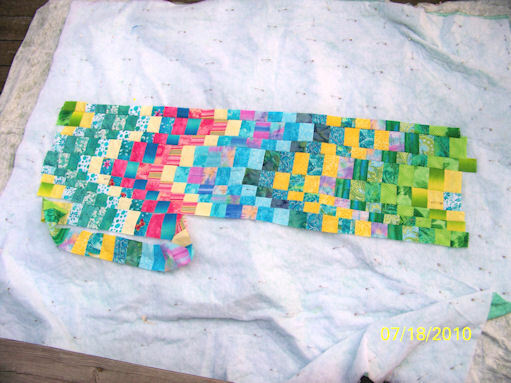 I will post pictures as I go along because it is a flip and sew BARGELLO style quilt that is quilted as you progress sewing the strips together. As a quilt pattern BARGELLO mimics the needle point stitch pattern. The strips provide movement by being off-set and moving the patches up or down to sewn next to a neighboring color. I have seen this quilt made with strips of the exact same size and of different size strips so there is a more pronounce asymmetrical movement of color. Bargello Quilts by Marge Edie. 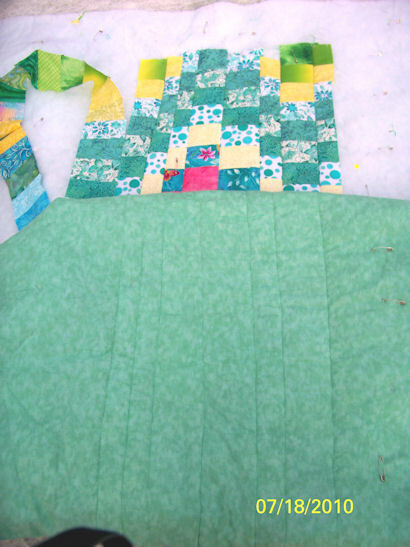 Marge’s method is a QUILT AS YOU GO / FLIP AND SEW TECHNIQUE. Her genius shows the quilter how to design her own patterns and quilt. She gives you the tools to design your own ONE OF A KIND Bargello Quilt. She give detailed instructions on how to make execute the techniques but she strongly recommends you plan your own colors and textures. She includes many design concepts. I used this book’s instructions to plan out my quilt. But I did not go as far as Marge does to draft it out. I am cutting different size strips and sewing them on as I go. I plan to go up and down in irregular intervals. I also plan to use the Fons and Porter Bargello method for cutting my strips by sewing them into a connected circle and then figuring out which color goes where to develop the pattern as I go. I am hoping this method will work because it looked like a lot of fun when I watched the show. BARGELLO QUILTS WITH A TWIST by Maggie Ball. This book was more of a pattern book Maggie gives you instructions on how to replicate her quilts with your fabric. She does show you different size strip sewing techniques and taking blocks made and laying them out in different pattern layouts. 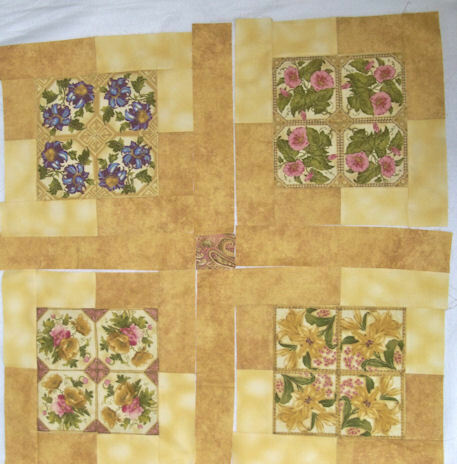 These blocks are made in a traditional one block at a time method, making the quilt top then quilting the top. The patterns are very graphic and geometric. Have a happy quilting day !